On Diwali's special occasion, Vivo, a smartphone manufacturer, has organized a bumper cell. Along with this, the company has given this cell as the Handset Percent Happyness Offer, and the customers will also benefit greatly from this sale. Along with this, the company is offering special offers with special discounts on its smartphones. The company is giving customers the chance to buy their phone Viva Nex for free. Also, the company is offering cashback up to 100 percent on VVO2. Vivo has partnered with Bajaj Finserv for this sale. Along with this, if the customer buys Vieu's phone from an online store, they can benefit. Not only this, the company is also giving cashback of 100 percent on the purchase of its phones. Also, this cell will last till November 15. 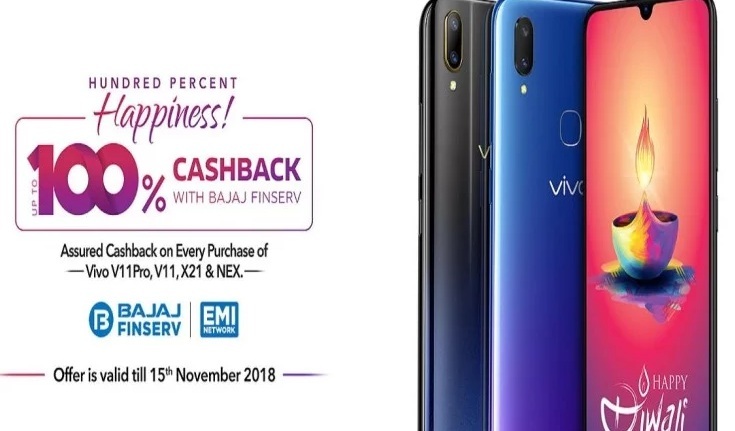 If the customer buys a phone from VivoV11 Pro, VivoV11, VivoV X21 and VVNex, then they can get a 100% cashback. On the other hand, the Lucky Draw scheme will also be available, in which 110 Lucky customers will make any one phone free. If customers do not get 100% cashback, then they will get a cashback of Rs. 500. At the same time, cashback will be available on payment by Bajaj Finserv and Mobikiqui Wallet. If you buy vivo v11 pro, Vivo V11 and Vivo VX21, Vivo Nex, then 110 Lucky customers will be selected, out of which a lucky customer will be paid the full amount of his phone. If you do not get this cashback, then a cashback of Rs 500 will be available, which will be in the Bajaj Finserve Link Mobikvic Valet. It is worth noting that Vivo V11 Pro costs Rs 25,990, Vivo V11 costs Rs 20,990, Vivo VX21 costs Rs 31,990 and Vivo Nex costs Rs 44,990. It is worth noting that Vivo was earlier organized on Diwali Carnival Sale at its e-store. During this time, the Vivo Y series from Vivo Nex was given exclusively discount, cashback and freebies to customers on the smartphone. Apart from this, a 5% cashback of HDFC's credit card and EMI was also given. Not only this, if Vivo uses Bajaj Finserv and any other credit card while buying a smartphone then there will be no EMI of interest.